Today we are aware of the importance of the micro cosmos, which is made of atoms and molecules. All objects around us consist of these tiny particles which in their detail are oblivious for us. But it is their interaction, i.e. their chemistry which has a direct effect on our daily life: For instance, special materials make vehicles faster and more effective. New drugs help us to live longer and healthier and many more� There is a clear potential for improving our life styles and solving global problems like energy and hunger once we are in control of this microscopic world. But in order to conserve our resources and cure diseases, detailed knowledge of the interaction of electrons, atoms, and molecules is indispensable. We have to answer questions like "what kind of characteristics, such as geometry and reactivity, do these particles have and how can we use them to design new compounds with the properties we desire?". For this reason we need to get a deep insight into atoms and molecules, which means single particles have to be studied experimentally and theoretically in order to understand how existing structures break-up and new bindings develop. The crux is that the micro cosmos is hard to access. In most cases the tiniest measuring probes or projectiles, which we can handle today, are of the same order of magnitude than the samples themselves since they are electrons or ions or short (laser) light pulses. However, since projectile and target have similar properties this fundamental kind of physics becomes comparable to a billiard game: The scientist shoots the white cue-ball with his cue onto a formation of colored balls which collide and diverge into different pockets. From the final state of these balls, i.e. the pockets they sunk-in and the initial velocity of the cue ball scientists like to calculate the trajectories of the particles. This provides knowledge about the structure and property of the target. In this classical picture modern physics can treat collisions of two balls exactly, which means there exists a mathematical solution that enables us to predict the trajectories and the outcome of the carom. Once there are more than two balls involved it becomes very difficult to make any prediction of the way the particles are going to take on the table. The understanding of many body dynamics is crucial since in most cases there are fore sure more than just two particles involved. But there is even more confusion: That is because the microscopic particles such as electrons, atoms, and molecules are not classical particles. They behave in a strange way, and most of the time they cannot be described by classical mechanics like the balls on our pool table but have to be treated by quantum mechanics. This modern theory is very well tested and amazingly successful, but it comes with some disadvantages as well. Since quantum mechanics is a statistical theory it doesn't make any prediction for single events, i.e. one shot on our pool table. Quantum theory does not provide us with a precise answer where the ball will go but only gives a probability for a certain outcome. As a consequence there is no motion of single particles in quantum mechanics, which means there are no clear trajectories but abstruse areas or clouds of localized particles, i.e. a probability density function. Thus, once we play with balls on a microscopic scale, our billiard table becomes covered by a black blanket or box; only the pockets are still visible. Our microscopic tokens are very strange objects: They resemble classical balls but at the same time they act like (water) waves as well. The outcome of some reactions can be described by their classical behavior while other reactions can only be understood because of their wave properties. There are also phenomena which can be explained by both properties, which means that classical mechanics and wave description result in the same final state. That means that, while we probe our microscopic target, we are playing two games at the same time: There is the classical pool billiard and simultaneously the felt gets replaced by water and our balls turn into stones, which generate and diffract waves underneath the black blanket. Only from the outcome in the pockets we sometimes can tell if we just played billiard or water games. This simple description implies two very fundamental properties of quantum mechanics which are so called superposition and non-locality. The superposition is a consequence of wave properties: Waves can interfere, which means they can add up or annihilate, and the system has to be described as the coherent sum of mathematical wave-functions, i.e. a particle can be in different states at the same time. At the moment of the measurement the system decides in which state it is in. We can not tell which state that is but give a certain probability. The non-locality describes the fact that particles are correlated with each other, although they are so far apart that their interaction by well-known forces such as gravity, nuclear, weak, and electromagnetic attraction or repulsion is apparently zero. That means particles are permanently connected and the state one of them is in bears information about the status of the other(s). Superposition and non-locality are directly responsible for important effects such as tunneling and interference of microscopic particles as well as the formation of correlated (Cooper-)pairs. Although these effects do not have any classical analogon in our well-known macroscopic world we make use of them in high resolution microscopes (STM) and ultra-strong electromagnets (built of superconductors). But even 100 years after modern physics these effects are not well understood. That is because superposition and non-locality are just strange and non-classical properties of micro-particles. Because of them it is hard or nearly impossible to generate simple pictures of natural phenomena and to come up with reliable predictions of atomic reactions. This is really weird since we make extensive use of quantum mechanics in order to explain and control the micro cosmos of atoms and molecules while we do not understand its fundamental key-properties. We only can speculate about their consequences and possible potential for our all-day life. Clearly it is the task of atomic physics to investigate what is going on here. In detail, after we gathered lots of knowledge about static time-independent atomic and molecular properties such as energy levels and angular momenta (etc.) over the last 100 years, scientists now need to know more about interference of particles and the dynamics of many body systems. The idea or dream is to reveal the entangled motion of free or even bound particles - or in other words to answer the question: What makes the collective motion of many particle systems tick? This will be the key challenge for the next decade(s). From the passage above we know that for many reasons it is very important to investigate the several ways of breaking-up bound atomic and molecular systems and to find out which mechanisms are behind these ionization processes. There are many ways to fragment such configurations. Besides particle collisions one of the most fundamental is the absorption of light, i.e. pure energy. Dissecting the target with light represents one of the most unperturbing ways to peer inside an atom or molecule. That is because photons have no charge, and for the present context mostly negligible masses. Photons will mainly just deposit their energy (or parts of it in higher energy regimes) and angular momentum in the system and kick-start the ionization process. So dealing with one photon (with a relatively long wavelength like in the VUV-range) we can speak of a rather soft fragmentation: The initial momenta, the Coulomb repulsion of the charged fragments, and the se-lection rules will then determine the dynamics in the final state. This is definitely a function of the photon wave length and the kinetic energy shared between the fragments. While the photo electric effect has been studied widely and successfully, coincident Compton scattering still remains a challenging project for theory and experiment. Besides the energy the polarization of the incoming light is another important property. Using circular polarized light allows an even more stringent test of quantum mechanics: The loss of a symmetry axis (the alignment of the polarization vector) results in less selection rules, which are restricting the final state. Moreover, with the information about the spin of the photon the experiment becomes complete: The direction of rotation and the propagation vector of the light define a tripod imposing chirality's to the initial state. On the other hand using many (30 or more) photons in a short laser pulse we have to expect different results: The intense field perturbs the atomic or molecular potential, other ionization processes occur (sequential, non sequential, re-scattering), and more angular momentum can be trans-ferred leading to many possible final states (especially in molecules). Depending on the development of short laser pulses at usable repetition rates, the investigations in this field have just started. Depending on the pulse period of the incoming light the intrinsic dynamics of bound many body systems can be mapped more or less directly into the final state. Pulses of single photons from synchrotrons are much longer than the typical times of most inner molecular vibrations. Laser and Free Electron Laser FEL pulses are very short (100 fs and shorter). 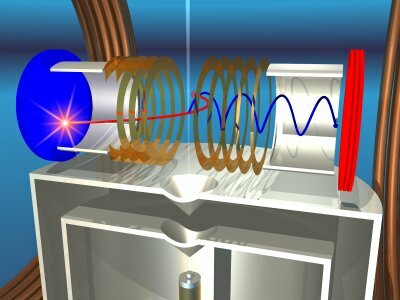 Femtosecond lasers synchronized to a FEL (such as LCLS in Stanford) will be available soon. With a combination of a laser and FEL pulse(s) the fragmentation time becomes so well resolved that inversions of chemical reaction could be examined: The FEL would start the fragmentation process which would be probed by laser pulses, followed by an investigation of the dynamics of the molecular outcome in momentum space as a function of the time delay between the two pulses. Similar experiments can be done combining high harmonic laser pulses. On the other hand, effects like the isomerization process (for example in C2H2) or excitation of high vibrational states can be induced by laser photon(s) and then be probed with a synchrotron pulse (fragmentation plus momentum spectroscopy): By doing so, the rearrangement processes respectively the inner nuclear dynamics can be probed time-resolved as a function of the laser-synchrotron-delay. However, combining pump and probe pulses with momentum spectroscopy represents the ultimate tool to unveil the inner dynamics of atoms and molecules. Up to now, this combination represents the softest way to peer inside atoms and molecules and it comes with a new time-coordinate. These multi coincidence experiments are not simple (high flux, stability and full control for the two different pulses are needed) but highly desirable. They will play an important role in future investigations of many particle dynamics and time resolved spectroscopy of chemical reactions. Resuming to the investigation of ionization mechanisms and the "damage" to nearest neighbors by the emission of particles mentioned above, the study of slow electron collisions, i.e. electron attachment plays an important role in the understanding of life sustaining processes: Low energetic electrons are born very easily in cells, molecules, clusters and on surfaces by any radiation or particle impact. Therefore experiments with slow electron-projectiles (1 to 20 eV) as well as studies of the release of low energetic electrons from surfaces via photo ionization are highly desirable. They are however difficult to perform. As mentioned above, a reaction microscope is needed which is able to image the final state momentum vectors of an ionization or fragmentation process in order to study the dynamics of the desired target. Instead of using dispersive electron and ion spectrometers, which detect only a small fraction of the entire phase space, a relatively new technique is used to unveil these properties. It is called COLTRIMS, which stands for COLd Target Recoil Ion Momentum Spectroscopy. This coincident electron and ion imaging technique has been invented and developed over the last 20 years (see [1, 2, 3]). The pioneers in the field include the groups of Prof. Dr. Horst Schmidt B�cking (University of Frankfurt/Germany), Prof. Dr. Lew Cocke (Kansas State University/USA) and Prof. Dr. Joachim Ullrich (Max Planck Institut Heidelberg). Its idea is pretty simple: The target (gas, cluster, solid) is intersected with the projectile beam (photons, electrons, ions, neutrals) in a weak electric field which is just strong enough to separate the fragments by their charge and guide them to large two dimensional position sensitive detectors. The field is so low (smaller then 50/cm) that no perturbation of the initial bound state occurs. Often a magnetic field in parallel (smaller then 30 Gauss) is used to prevent high energetic electrons from leaving the spectrometer by forcing the light particles gyrating towards the detector. This little trick helps to keep the electric field low which warrants a good resolution (see fig. 1). Figure 1: Schematically drawing of the momentum spectrometer: The deuterium molecules, prepared in a supersonic jet going from the bottom to the top, are intersected with the pulsed photon beam in the middle of the copper rings which define a homogenous electrical field. The big coils represent a Helmholtz pair which establishes a homogenous magnetic field in parallel to the spectrometer axis. The nuclei are guided to a position sensitive detector to the left while the electrons get spiraled to the right (due to their low mass in the magnetic field). With the knowledge of the dimensions of the spectrometer and the magnitudes of the electromagnetic field the three momentum components of each particle can be deduced from the time of flight to and the position on the specific detector. The detectors themselves represent the heart of the momentum spectrometer. Their size, resolution and multi-hit capability determine the success of the experiment and the quality of the results. We use fast multi channel plate detectors (40, 80 and 120 mm diameter) to convert and amplify electrons, ions or even photons into a cloud of electrons which hits a two dimensional delay line anode mounted in behind, giving information about the position of impact on the channel plate (see fig. 2 and ). These detectors have been developed and permanently enhanced in the group in Frankfurt and are now commercially available from the RoentDek Company. As a result many other groups all around the world use this technology now. By using one to three detectors in one experiment the electronic read-out and coincident techniques are similar to small set-ups in nuclear science and also that powerful: All data are written in list-mode format which allows to rerun the experiment offline on the computer over and over again by filtering out bad events and doing further calculations. The next improvement will be a very fast and pulse-height sensitive read-out of the detectors (fast transient recorder) which will replace the rather slow NIM and CAMAC standard of nuclear physics used so far. This system was already tested in a first experiment and we expect the multi-hit dead time between the registrations of two hits on the detector to go down significantly, which is very important for the investigation of many particle systems. The power of this list-mode data acquisition technique is essential for the success of such complex experiments at the FEL with its very limited beamtime. Figure 2: Photograph of the position sensitive delay detector from the RoentDek Company. On top of the square aluminum you see the multi channel plate z-stack. Two layers of copper wires a located underneath. Another important component of the experimental set-up is the preparation of the target. For most of the time gases are used which are prepared in a supersonic expansion formed by high pressure (4 to 40 bar) at a tiny nozzle (50 microns or smaller). The gas beam is then skimmed down by small and sharp apertures. This provides a well localized and cool target (1 mm diameter, 20 �K going down to mK) necessary for a good position-, time and energy resolution. Furthermore a special layout of the momentum spectrometer (a so called Wiley-McLaren geometry) and the use of electric lenses make focusing in time and position possible. Also surfaces, clusters, dimers and liquids (like water for instance) have been analyzed with this technique (see [5, 6, 7, 8] for instance). A suprafluid and also a spin polarized target are currently set-up in Frankfurt and will be available pretty soon. On top of this, the flexibility of the momentum spectrometer is very remarkable: The set-up (con-sisting mainly of copper-rings defining the electric field, ceramic rods and metal meshes) is pretty cheap, easy to simulate numerically and quickly changeable. By now this experimental technique known as COLd Target Recoil Ion Momentum Spectroscopy (COLTRIMS) was able to measure electrons from 0.5 to 200 eV in coincidence with recoiling ions from 5 meV to 15 eV with 4 solid angle in (e,2e), (e,3e), ion-atom, ion-molecule collisions, and photo ionization processes (with syn-chrotron radiation and strong femtosecond laser pulses). Since it is a spectrometer to track-back the dynamics of fragmentation processes it is also called a 'reaction microscope'. It is under continual improvement and has proven to be a powerful and considerable tool for the investigation of many particle dynamics.